Straight-and-level unaccelerated flight consists of maintaining the desired altitude, heading, airspeed, and pedal trim. The attitude indicator gives a direct indication of the pitch attitude of the helicopter. In visual flight, attain the desired pitch attitude by using the cyclic to raise and lower the nose of the helicopter in relation to the natural horizon. During instrument flight, follow exactly the same procedure in raising or lowering the miniature aircraft in relation to the horizon bar. There is some delay between control application and resultant instrument change. This is the normal control lag in the helicopter and should not be confused with instrument lag. The attitude indicator may show small misrepresentations of pitch attitude during maneuvers involving acceleration, deceleration, or turns. This precession error can be detected quickly by cross-checking the other pitch instruments. If the miniature aircraft is properly adjusted on the ground, it may not require readjustment in flight. If the miniature aircraft is not on the horizon bar after level off at normal cruising airspeed, adjust it as necessary while maintaining level flight with the other pitch instruments. Once the miniature aircraft has been adjusted in level flight at normal cruising airspeed, leave it unchanged so it gives an accurate picture of pitch attitude at all times. When making initial pitch attitude corrections to maintain altitude, the changes of attitude should be small and smoothly applied. The initial movement of the horizon bar should not exceed one bar width high or low. [Figure 8-3] If a further adjustment is required, an additional correction of onehalf bar normally corrects any deviation from the desired altitude. This one-and-one-half bar correction is normally the maximum pitch attitude correction from level flight attitude. Figure 8-3. The initial pitch correction at normal cruise is one bar width or less. After making the correction, cross-check the other pitch instruments to determine whether the pitch attitude change is sufficient. If additional correction is needed to return to altitude, or if the airspeed varies more than 10 knots from that desired, adjust the power. The altimeter gives an indirect indication of the pitch attitude of the helicopter in straight-and-level flight. Since the altitude should remain constant in level flight, deviation from the desired altitude indicates a need for a change in pitch attitude and power as necessary. When losing altitude, raise the pitch attitude and adjust power as necessary. When gaining altitude, lower the pitch attitude and adjust power as necessary. Indications for power changes are explained in the next paragraph. The rate at which the altimeter moves helps to determine pitch attitude. A very slow movement of the altimeter indicates a small deviation from the desired pitch attitude, while a fast movement of the altimeter indicates a large deviation from the desired pitch attitude. Make any corrective action promptly with small control changes. Also, remember that movement of the altimeter should always be corrected by two distinct changes. The first is a change of attitude to stop the altimeter movement; the second is a change of attitude to return smoothly to the desired altitude. If altitude and airspeed are more than 100 feet and 10 knots low, respectively, apply power in addition to an increase of pitch attitude. If the altitude and airspeed are high by more than 100 feet and 10 knots, reduce power and lower the pitch attitude. There is a small lag in the movement of the altimeter; however, for all practical purposes, consider that the altimeter gives an immediate indication of a change or a need for change in pitch attitude. Since the altimeter provides the most pertinent information regarding pitch in level flight, it is considered primary for pitch. The VSI gives an indirect indication of the pitch attitude of the helicopter and should be used in conjunction with the other pitch instruments to attain a high degree of accuracy and precision. The instrument indicates zero when in level flight. Any movement of the needle from the zero position shows a need for an immediate change in pitch attitude to return it to zero. Always use the VSI in conjunction with the altimeter in level flight. If a movement of the VSI is detected, immediately use the proper corrective measures to return it to zero. If the correction is made promptly, there is usually little or no change in altitude. If the needle of the VSI does not indicate zero, the altimeter indicates a gain or loss of altitude. The initial movement of the vertical speed needle is instantaneous and indicates the trend of the vertical movement of the helicopter. A period of time is necessary for the VSI to reach its maximum point of deflection after a correction has been made. This time element is commonly referred to as instrument lag. The lag is directly proportional to the speed and magnitude of the pitch change. When employing smooth control techniques and small adjustments in pitch attitude are made, lag is minimized, and the VSI is easy to interpret. Overcontrolling can be minimized by first neutralizing the controls and allowing the pitch attitude to stabilize, then readjusting the pitch attitude by noting the indications of the other pitch instruments. Occasionally, the VSI may be slightly out of calibration. This could result in the instrument indicating a slight climb or descent even when the helicopter is in level flight. If the instrument cannot be calibrated properly, this error must be taken into consideration when using the VSI for pitch control. For example, if a descent of 100 feet per minute (fpm) is the vertical speed indication when the helicopter is in level flight, use that indication as level flight. Any deviation from that reading would indicate a change in attitude. 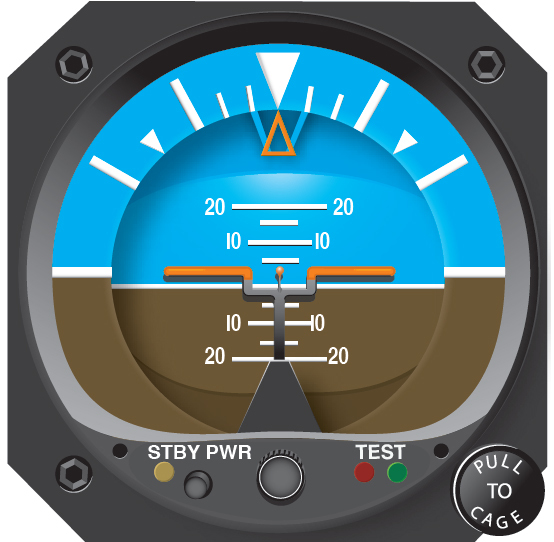 The airspeed indicator gives an indirect indication of helicopter pitch attitude. With a given power setting and pitch attitude, the airspeed remains constant. If the airspeed increases, the nose is too low and should be raised. If the airspeed decreases, the nose is too high and should be lowered. A rapid change in airspeed indicates a large change in pitch attitude, and a slow change in airspeed indicates a small change in pitch attitude. There is very little lag in the indications of the airspeed indicator. If, while making attitude changes, there is some lag between control application and change of airspeed, it is most likely due to cyclic control lag. Generally, a departure from the desired airspeed, due to an inadvertent pitch attitude change, also results in a change in altitude. For example, an increase in airspeed due to a low pitch attitude results in a decrease in altitude. A correction in the pitch attitude regains both airspeed and altitude.